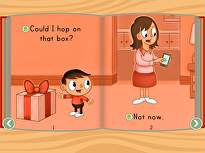 Write the Sight Words: "Him"
Knowing the sight word "him" can help improve your child's reading skills. 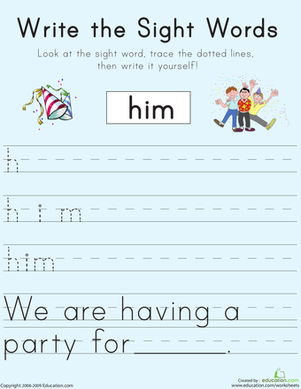 This worksheet will help your child learn the sight word "him" by having her trace the different letters in the word. Though the repetition of writing the word she will gain practise that will help her memorize the word. After she finishes this worksheet she will have used the sight word in a complete sentence and practiced her handwriting. 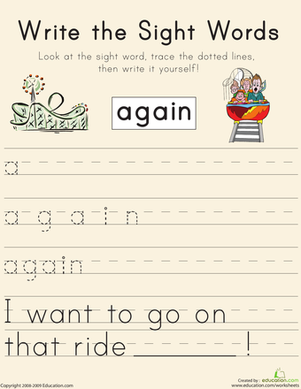 Write the Sight Words: "As"
Looking for a phonics worksheet to help your child with sight words? 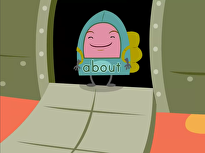 This printable will give him practise with the word "as". 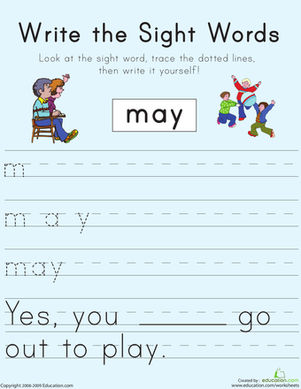 Write the Sight Words: "May"
Looking for a phonics worksheet to help your child with sight words. This printable will give him practise with the word "may". 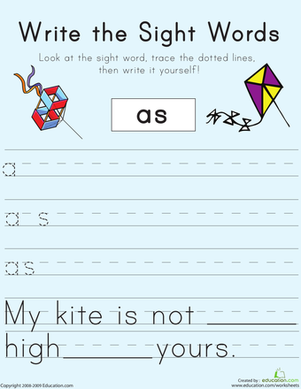 Write the Sight Words: "Know"
Looking for a phonics worksheet to help your child with sight words. 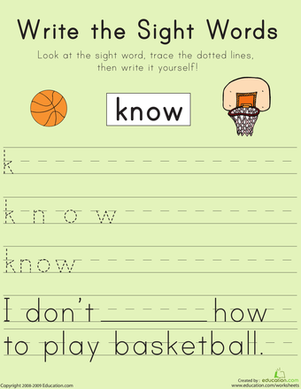 This printable will him practise with the word "know". 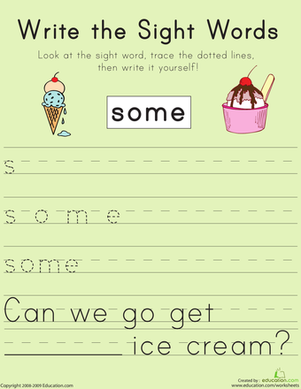 Write the Sight Words: "Some"
Looking for a phonics worksheet to help your child with sight words? This printable will give him practise with the word "some". Looking for a phonics worksheet to help your child with sight words? This printable will give him practise with the word "again". Looking for a phonics worksheet to help your child with sight words? This printable will him practise writing sentences. 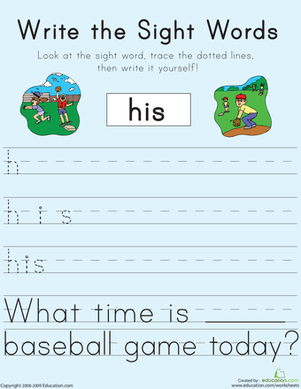 Write the Sight Words: "His"
Looking for a phonics worksheet to help your child with sight words. This printable will give him practise with the word "his". Write the Sight Words: "Give"
Looking for a phonics worksheet to help your child with sight words? This printable will give him practise with the word "give". 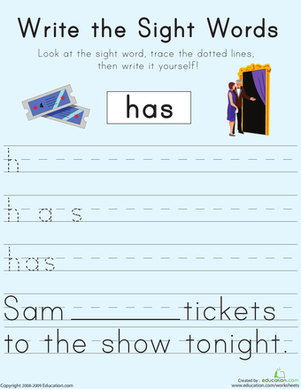 Write the Sight Words: "Has"
Looking for a phonics worksheet to help your child with sight words? This printable will give him practise with the word "has". 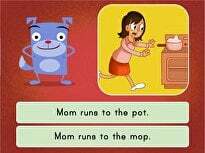 Write the Sight Words: "Put"
Looking for a phonics worksheet to help your child with sight words? This printable will give him practise with the word "put". Write the Sight Words: "Thank"
Looking for a phonics worksheet to help your child with sight words? This printable will give him practise with the word "thank". 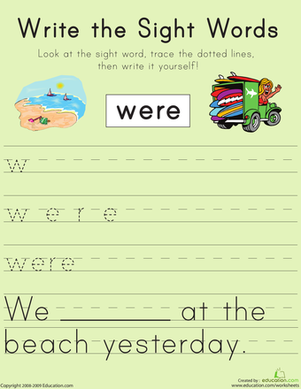 Write the Sight Words: "Were"
Looking for a phonics worksheet to help your child with sight words? This printable will give him practise with the word "were".